Sometimes along comes a tech story that diverges from our usual hardware subject matter yet which just begs to be shared with you because we think you will find it interesting and entertaining. XKCD 327, Exploits of a Mom (CC BY-NC 2.5). You will no doubt be familiar with the XKCD cartoon number 327, entitled “Exploits of a Mom”, but familiarly referred to as “[Bobby Tables]”. In it a teacher is ringing the mother of little [Robert’); DROP TABLE Students; –], whose name has caused the loss of a year’s student records due to a badly sanitized database input. We’ve all raised a chuckle at it, and the joke has appeared in other places such as an improbably long car license plate designed to erase speeding tickets. It’s nice to see that Companies House sanitise their database inputs. 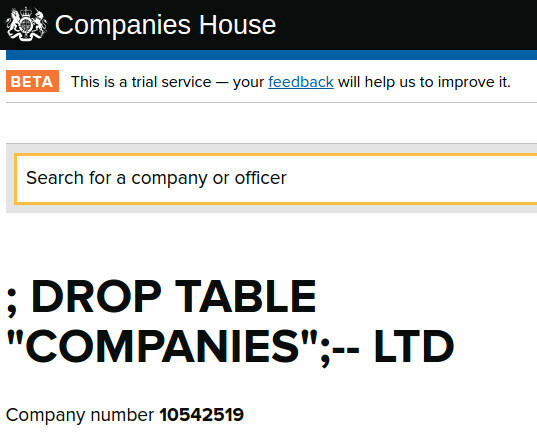 Today we have a new twist on the Bobby Tables gag, for someone has registered a British company with the name “; DROP TABLE “COMPANIES”;– LTD“. Amusingly the people at Companies House have allowed the registration to proceed, so either they get the joke too or they are unaware of the nuances of a basic SQL exploit. It’s likely that if this name leaves Her Majesty’s civil servants with egg on their faces it’ll be swiftly withdrawn, so if that turns out to be the case then at least we’ve preserved it with a screenshot. Of course, the chances of such a simple and well-known exploit having any effect is minimal. There will always be poor software out there somewhere that contains badly sanitized inputs, but we would hope that a vulnerability more suited to 1996 would be vanishingly rare in 2016. If by some chance you haven’t encountered it before we’d recommend you read about database input sanitization, someday it may save you from an embarrassing bit of code. Meanwhile we salute the owner and creator of this new company for giving us a laugh, and wish them every success in their venture. Ten years ago, highbrow culture magazine The New Yorker started a contest. Each week, a cartoon with no caption is published in the back of the magazine. Readers are encouraged to submit an apt and hilarious caption that captures the magazine’s infamous wit. Editors select the top three entries to vie for reader votes and the prestige of having captioned a New Yorker cartoon. The magazine receives about 5,000 submissions each week, which are scrutinized by cartoon editor [Bob Mankoff] and a parade of assistants that burn out after a year or two. But soon, [Mankoff]’s assistants may have their own assistant thanks to Microsoft researcher [Dafna Shahaf]. [Dafna Shahaf] heard [Mankoff] give a speech about the New Yorker cartoon archive a year or so ago, and it got her thinking about the possibilities of the vast collection with regard to artificial intelligence. The intricate nuances of humor and wordplay have long presented a special challenge to creators. [Shahaf] wondered, could computers begin to learn what makes a caption funny, given a big enough canon? [Shahaf] threw ninety years worth of wry, one-panel humor at the system. Given this knowledge base, she trained it to choose funny captions for cartoons based on the jokes of similar cartoons. But in order to help [Mankoff] and his assistants choose among the entries, the AI must be able to rank the comedic value of jokes. And since computer vision software is made to decipher photos and not drawings, [Shahaf] and her team faced another task: assigning keywords to each cartoon. The team described each one in terms of its contextual anchors and subsequently its situational anomalies. For example, in the image above, the context keywords could be car dealership, car, customer, and salesman. Anomalies might include claws, fangs, and zoomorphic automobile. The result is about the best that could be hoped for, if one was being realistic. All of the cartoon editors’ chosen winners showed up among the AI’s top 55.8%, which means the AI could ultimately help [Mankoff and Co.] weed out just under half of the truly bad entries. While [Mankoff] sees the study’s results as a positive thing, he’ll continue to hire assistants for the foreseeable future. Humor-enabled AI may still be in its infancy, but the implications of the advancement are already great. To give personal assistants like Siri and Cortana a funny bone is to make them that much more human. But is that necessarily a good thing? There I Fixed It: A blog about hacking, poorly. Thereifixedit.com is a site filled with dubious innovations. Some of them are cool, some of them are clever, and most of them are terrifying. Anyone who has ever stood in front of a broken household appliance with a roll of duct tape, one screw driver with a bit chipped off the flat part, and determination will laugh themselves silly browsing through this site. Maybe some of the ghetto hacks we covered before should be in this list. Websites keep publishing poorly executed jokes today; how can I fix this? We’ve been getting a lot of questions on the tip line like the one above, so we put together this one-step illustrated how-to. If you’re not the physical labor type, you can use [Steve Lambert]’s SelfControl.